Clydesdale Men’s 1st XI lost their third league game in a row as they suffered a second half capitulation at home to Watsonians. A dominant first half from the M1s brought them a deserved lead when Struan Walker – fresh from his two week absence – picked up a pass to right of the penalty circle before smacking in his 12th goal of the season literally seconds before half time. Watsonians, however, responded within minutes of the restart when a forward drove the baseline before his cutback to a fellow forward saw him convert from close range. The away side then stunned the home side with three more goals in the space of two second half minutes. A forward found a break of the ball before rounding Sean Mahoney and reversing in to give Watsonians the lead. The lead was doubled through a penalty flick sent low past Mahoney’s right hand side and the fourth goal saw a sweeping move from left to right finishing with a pass from the right to left for a simple tap in at the back post. The away side completed ‘Dale’s misery by adding a fifth when a forward’s attempted shot was batted in low by a fellow unmarked teammate. Despite a few chances at the end for the M1s – most notably from Walker – Watsonians held on, leaving Clydesdale stuck on eleven points and in sixth place of Men’s National Division One. 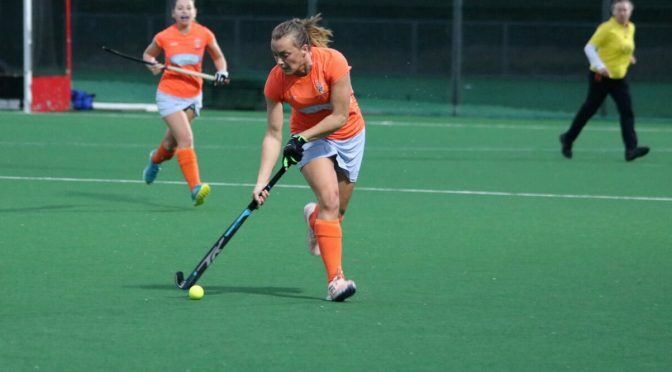 Heather Howie kept up her fine form in front of goal as her brace helped move Clydesdale Western up to third in Women’s National Division One following their second half comeback against Watsonians at Peffermill. The L1s would have been keen to avoid any upset similar to last season’s 1-0 defeat back in March, which ultimately saw the girls miss out on the WNL 1 title. And those memories may have come flooding back when they went in at half time 1-0 down. But ‘Dale Western responded magnificently, with Howie’s goalscoring purple patch producing another two goals to take her up to seven for the season in all competitions. Ali Eadie got the other goal as the L1s took all three points back to Glasgow. Results elsewhere means Clydesdale Western move up to third in the league table, three points off top spot, Edinburgh University. In the rest of Saturday’s games, the M2s finally won their first league game of the season in Men’s Regional Division One, beating Inverleith at Titwood. Both sides went in to the game with eight out of eight games lost. The M2s recovered from going an early goal down to win 7-2. Ciaran Crawford continued his return to hockey with a hattrick. Fraser Hirst chipped in with a brace whilst Blair Paul and Scott Lindsay scored the others. The M3s lost 2-1 at home to Rottenrow 1s in Men’s West District Division One. This was after Conor Oliver had cancelled out a Rottenrow opener, but the away side struck late to take the points. The M4s won 3-0 away to Greenock 2s – Owen Gould scoring a brace and captain Russell Bradley grabbing the other. Despite youngster Logan Forsyth scoring his first ever senior goal, the M5s lost 4-1 at Hutchesons’ Grammar School to Oban 1s. The L2s rebuilding of a shaky start to their Women’s Championship Division One campaign continued as they beat Stirling University 3-1 at home through goals from Heather Lang, Hannah MacDonald and Iona MacIntyre-Beon. Helen Walker scored a treble in the L3s 4-2 away win over Grove Menzieshill – Aisha Rasul scored the other goal. The L4s lost 3-0 at Glasgow Accies, but the L5s picked up all three points as Kirstin Stobo, Lucy Anderson and Anais Bonner scored a goal each in a 3-1 win over Ferguslie 1s at Hutchesons’ Grammar School. Have a read at our ‘Weekend Review’ from Sunday’s cup contests – just click here.